Kichijoji is a booming town in which you'll see new shopping malls, an abundance of fashionable clothing stores and trendy restaurants and much more. 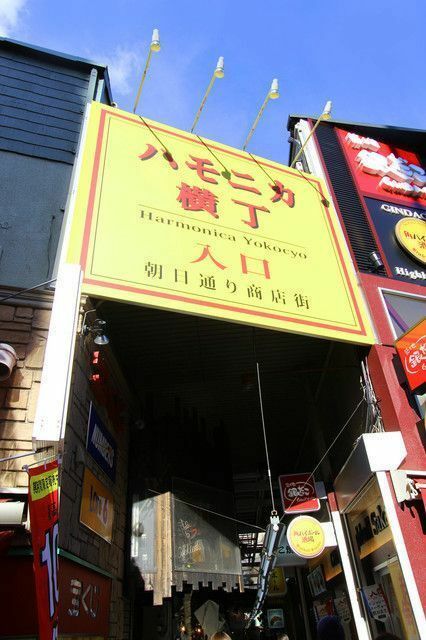 Harmonica Yokocho is not the type of place you would expect in such an area. The contrast between the old-fashioned yokocho atmosphere and the rest of the city makes the Harmonica Yokocho alleys all the more interesting. A must go place if you visit Kichijoji! To get there, exit through the Kichijoji Station's North Exit. Across the street to your left, you should see the big yellow sign marking the yokocho's main entrance. Formerly, these alleys used to be part of a flea market. They have evolved through the years to become a vibrant collection of small stores, restaurants, and bars selling and offering good quality products at a decent price. The place becomes particularly lively at night. Unlike some other yokocho alleys that are primarily drinking places, you have many good reason to take a stroll in Harmonica Yokocho during the day! How about doing an eating tour of the area? You can grab some cheap Japanese sweets such as this taiyaki. They are usually filled with azuki sweet beans or custard. It's certainly interesting to see the chef cook them before you. A nice feature of the Harmonica Yokocho alleys is that there are many taverns that operate as brunch restaurants from the morning, serving Japanese-style all-you-can-eat meals. These are usually quite cheap too (below 1,200 yen) and you get to have really nice home-made style Japanese soul foods! You can find good and cheap fresh fish donburi (sashimi on a bed of rice) too! Grabbing a cold beer on a hot day is never a bad idea! Lanterns light up some of the bars, creating a warm, welcoming atmosphere. Most places are quite small but there are a few taverns with pretty wide spaces. Everywhere gets really crowded from the early evening. You can get a variety of tsumami (food to eat with alcohol). Skewers are always nice. You can buy them usually for about 100 to 200 yen a piece. Typical scene of a yokocho alley: people sitting on small chairs outside the tiny bars. The proximity to other customers makes it easy to start a conversation. Drinks can be pretty cheap. Some places sell everything for 300 yen. Harmonica Yokocho is somewhat of a fish place. There are some good shops there where you can buy fresh fish. The restaurants and bars also have fish on their menu. Japanese-style grilled mackerel slightly salted is so delicious. It goes wonderfully well with sake or beer too. A Nice glass of "Harmonica High", a whiskey-based drink popular in the alleys. Feeling hungry after drinking all night? How about some gyoza (Chinese dumplings) at this Chinese restaurant! Gyozas are also a popular tsumami. For other guides of the back alleys of Tokyo, please check out the links below. Shinjuku Asia Yokocho: A Rooftop Beer Garden with a Southeast Asian Night Market Atmosphere! Eating Tour Guide of Ameyoko in Ueno!